Will the US Dollar Become the Lowest Yielding Currency in the World? 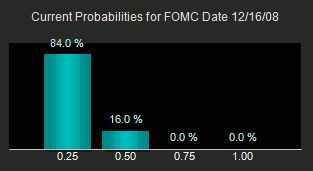 Fed fund futures are already pricing in a greater chance that the central bank will cut rates by 75bp on December 16th than 50bp. That would bring US interests down to 0.25% and turn the US dollar into the lowest yielding currency in the developed world. Since Japan’s interest rate is currently 0.3%, if the US takes rates below Japan’s levels we could see a downward adjustment in USD/JPY. At this point, taking interest rates to zero may only have limited impact on the financial markets because short term yields are already trading near those levels. Beyond that comes quantitative easing and in many ways, the Federal Reserve’s latest announcements about buying Fannie and Freddie debt already constitutes quantitative easing. However there is hope as the continual decline in oil prices will help to cushion the blow of a softening economy for US consumers while the prospect of 4.5 percent mortgage rates could help to reinvigorate the housing market. In addition to the retail sales report, we also expect pending home sales, the trade balance, producer prices and the University of Michigan consumer confidence survey from the US this week. EUR: Will it Remain Immune to Weak Data?